Snakebite envenoming is a frequently overlooked cause of mortality and morbidity. Data for snake ecology and existing snakebite interventions are scarce, limiting accurate burden estimation initiatives. Low global awareness stunts new interventions, adequate health resources, and available health care. Therefore, we aimed to synthesize currently available data to identify the most vulnerable populations at risk of snakebite, and where additional data to manage this global problem are needed. We assembled a list of snake species using WHO guidelines. Where relevant, we obtained expert opinion range (EOR) maps from WHO or the Clinical Toxinology Resources. We also obtained occurrence data for each snake species from a variety of websites, such as VertNet and iNaturalist, using the spocc R package (version 0.7.0). We removed duplicate occurrence data and categorized snakes into three groups: group A (no available EOR map or species occurrence records), group B (EOR map but <5 species occurrence records), and group C (EOR map and ≥5 species occurrence records). For group C species, we did a multivariate environmental similarity analysis using the 2008 WHO EOR maps and newly available evidence. Using these data and the EOR maps, we produced contemporary range maps for medically important venomous snake species at a 5 × 5 km resolution. We subsequently triangulated these data with three health system metrics (antivenom availability, accessibility to urban centres, and the Healthcare Access and Quality [HAQ] Index) to identify the populations most vulnerable to snakebite morbidity and mortality. We provide a map showing the ranges of 278 snake species globally. Although about 6.85 billion people worldwide live within range of areas inhabited by snakes, about 146.70 million live within remote areas lacking quality health care provisioning. Comparing opposite ends of the HAQ Index, 272.91 million individuals (65.25%) of the population within the lowest decile are at risk of exposure to any snake for which no effective therapy exists compared with 519.46 million individuals (27.79%) within the highest HAQ Index decile, showing a disproportionate coverage in reported antivenom availability. Antivenoms were available for 119 (43%) of 278 snake species evaluated by WHO, while globally 750.19 million (10.95%) of those living within snake ranges live more than 1 hour from population centers. In total, we identify about 92.66 million people living within these vulnerable geographies, including many sub-Saharan countries, Indonesia, and other parts of Southeast Asia. 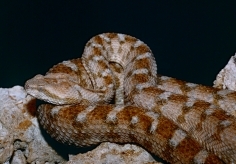 Identifying exact populations vulnerable to the most severe outcomes of snakebite envenoming at a subnational level is important for prioritizing new data collection and collation, reinforcing envenoming treatment, existing health care systems, and deploying currently available and future interventions. 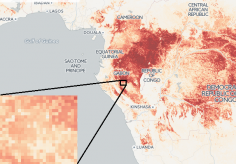 These maps can guide future research efforts on snakebite envenoming from both ecological and public health perspectives and better target future estimates of the burden of this neglected tropical disease.